Shiny red bikes, tea parties, camp-outs, and birthdays! Come join the animal youth of Fern Valley as they learn from the situations in their lives. Mildred and Roberta Cornstalk are chickens who love to entertain guests. Will their tea party be a success? Betsy Woolrich struggles with loneliness while her parents are away. Will they make it home for her birthday? Tommy and Abigail Bigpaw learn the value of an open mind. Is it possible that Mrs. Sharpbeak might be fun even though she's old? Sammie Gruff gets an early lesson in financial responsibility. Will she get that shiny red bike that she wants so bad? 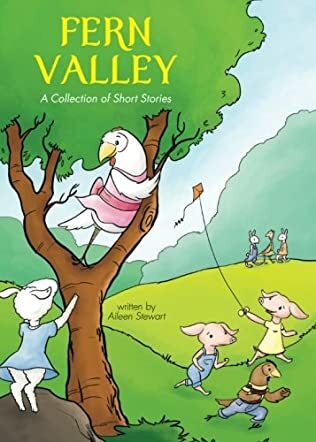 The short stories in Fern Valley by Aileen Stewart are laced with teachings about acceptance, truth, and other positive morals. Children will be able to easily relate to the characters and their daily experiences. The unique characters are fun and amusing. I would recommend this book to children ages 5 to 10. A great way to use this book would be for a parent and a child to read it together before bedtime each night. The stories are long enough to entertain, but short enough to be readable within a few minutes. Children will look forward to meeting with Fern Valley's inhabitants each night. My only objection to the book is its use of the word “darn” twice. It borders too close to cussing and I don't feel that the story would be missing anything if it wasn't in there. Since this book is specifically for children, I feel it would be better if that word had been omitted.